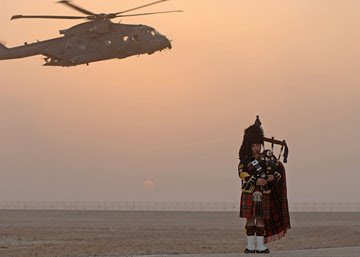 "Royal Scots Dragoon Guards piper Maj. Ross Munro played his pipes during sunset whilst based at the Contingent Operating Base (COB), Basra, during Op TELIC 12 on Aug. 22. Munro played for Universal Music of London who are producing a CD including the sound of pipes and drums of the Royal Scots Dragoon Guards for their second album." "Right, this is Pipey's Corner - don't mess with it!" This went down last week. The Taliban need high profile attacks to continue their IO campaign. Dozens of attacks each day targeting NGOs, Coalition and Afghan security forces. There are some new players coming to the fore. Is there another surge on the way? Clearly, China was using the 2008 Olympics as a political stage in an attempt to show that they are not only in the 21st century, they are leading the way. This wasn't the Beijing Olympics, it was the Chinese Olympics. To that end, they did a great job. I've been curious about the Olympics and the medal count that was shown everywhere. As Americans, we've grown accustomed and expect to lead the medal race. There was something odd though. The Chinese actually had more golds (after the very first medals awarded on the first day to the US Women's Fencing team who swept the medals there). So, I got to thinking. 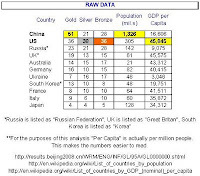 China had more gold, but the US had more overall medals. Do you count only gold (the gold is, after all, given to the actual winner), do you count total medals? Surely, gold are worth more. What if you weighted the total medal count to give more credit for doing better? If you're going that far, why not factor in the population of the country? The top three medal winners, no matter how you count them were the most populated countries. What about proportion? What about rich countries? Can you "buy" more medals? If you were curious too, then I have the break down for you. First, I start with the raw data of the top eleven countries (I meant to do the top ten, but I miss counted) as ranked by the official Olympic site. Then I include the population in millions, then the Per Capita GDP based on the IMF report (references sited below). I move the decimal point around a bit to show more clearly the breakdown. The number of gold medals by population, for instance, is in the ten millionths (or only one in ten million for the low end). Since I move the decimal, the same amount for each country there should be no problem. I sorted by the numbers in the first column of each table, but I highlighted the winners of the other categories in each table as well. By the way, the rest of the top 20 were: Netherlands, Jamaica, Spain, Kenya, Belarus, Romania, Ethiopia, Canada and Poland. This was a week of many high level decisions - I had a part in some of the long work to get ready for the General Officers to decide rather alot of important things. Overall, it went very well. I was quite elated at first, then it struck me - several of us had put in many, many hours to get these results. Fortune had nothing to do with it, nor did we do anything fancy or unique. Whoever said "luck is the residue of hard work" (or was it "of good design"?) was probably right. On a lesser note - one thing you don't want to hear around here is the dreaded phrase, "tiger team". Really, you don't. Maybe the Dangar! is from the Super Bazooka air conditioner? Not much to say here. Work, work, work, work, work, work. Then some work. Since I haven't got anything worth reporting, I figured I'd just post some random photo I took while near Basrah. That is what someone must have. Well, that and access to a whole bunch of stickers from their daughter or such. The Men's rest rooms (both of them) in the building I work have been covered in stickers - I think they are one of those Groovy Girls or Bratz or whatever the younger set likes. Probably one of the odder pranks I've seen to date. 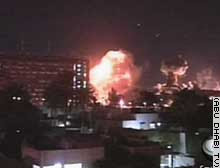 This report this morning says that a base near Khost, Afghanistan was attacked by suicide bombers. There are two bases (or at least there were when I left) near Khost, but they were both US bases. 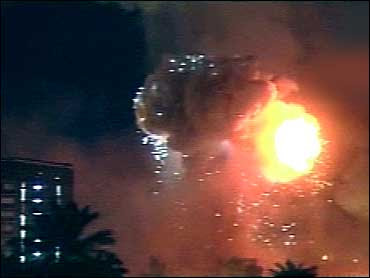 The good news is the suicide bombers got their wish and there were no ISAF casualities. Unfortunately there were civilian casualities and that is very sad. Their families have my sympathy. If this was FOB Salerno, then given that the attackers were engaged 1000 yards from the base with small arms indicates to me that the Afghans actually did the direct fighting until the helicopters got there. There is a defensive ring manned by Afghans about 400 yards beyond the actual base wire (I'm not giving any secrets away here, the towers are plainly visable). This report also says that the base was attacked recently by a car bomb or VBIED (vehicle borne improvized explosive device (at least I assume it was improvized)) and that that attack was repelled at the gate. I wonder if the new gate, to the east, closer to the road intersection was ever built. I appologize that there are more questions than answers in this post. I had jumped into the Blackhawk with my helmet sliding around - chinstrap askew, goggles knocked about - when a passenger took this shot of me. I kind of like the reflection off of my sunglasses - you can see Baghdad in them. Down to a sun baked sea. Enfolding overly sunny spots of mundanity. Down the green non-hill athwart an urban cover ! By woman wailing in fear of her Uday-lover ! It flung up momently the Tigris River. Jaish al-Mahdi voices prophesying war ! From the traffic and the drivers' raves. A traffic circle blocked by a truck of ice! That shabby dome ! those bags of ice ! And all should cry, Look There ! Look There ! His baggy eyes, his messy hair ! And spoilt the milk of Paradise. My apologizes to Samuel Coleridge. I remember this building...I had seen it before. Ah, I cannot remember where, but I am pretty sure I saw that building take a hit or two on TV during the initial invasion. Now I am walking by and see the thing... go figure. This Jock offered to trade his rifle for mine, on the spot. His was much heavier. He wasn't even fazed when I told him that ours jammed more frequently than theirs. These Iraqi Army 14th Division mechanics were enjoying themselves quite a bit. Er, I may have actually done this m'self, way back when, to be fair about it. These things...what are they called again? What is they call these things again...hmmm? Coming as I did from Camp Al Shaheed Wessam, these large things with the green bits are quite unfamiliar. The name seems to elude me... I know they are something that rhymes with "ants". Ah! PLANTS! One benefit of being in Baghdad. Actual plant life.